This year we raised $3,559 for Second Harvest Food Bank and the National Alliance on Mental Illness SC! Way to go yoga community! Big thanks to Samantha S. Brown & Kelly Blaser for co-teaching with me, Cat Willis for donating the Tannery World Dance Center, Poppy de Garmo for use of her photo studio to mingle and eat post-yoga snacks, and Peggy Galusha & Susie Kavanagh Ramaekers for helping me out day-of! Tea and light snacks served following class. 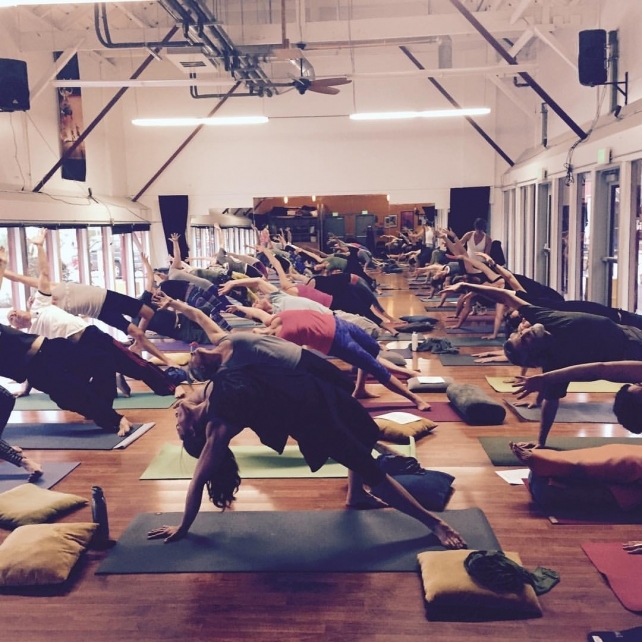 As yogis we know that the practice can help heal our hearts, build community, and nourish us. At the core of the yoga practice is a deep desire to see all beings be happy, fed, and have everything they need to be free of suffering. As we move into the season of abundance, we have the ability to give freely to others. Please join us this year for a very special group practice to benefit both Second Harvest Food Bank, and NAMI Santa Cruz. Second Harvest Food Bank helps to feed our many hungry families in Santa Cruz County, and NAMI SC raises community awareness about mental health and provides support and education to communities and families affected by mental health issues.